Preen® Extended Control Weed Preventer 4.93 lb. For 50 years, gardeners have trusted Preen® Weed Preventer products to help keep their garden and landscape beds weed-free for months. Preen® Extended Control Weed Preventer is the longest lasting Preen® yet, stopping weeds for up to six months per application. It’s labelled for use around 600 plants in perennial flower beds; around groundcovers, trees and shrubs; and in xeriscape settings and rock gardens. 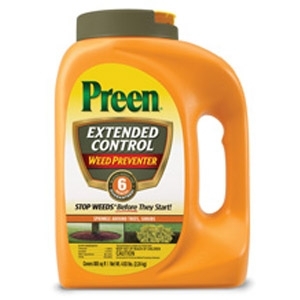 Preen® Extended Control Weed Preventer tackles many of the toughest weeds a gardener faces, including: dandelions, crabgrass, field bindweed, white clover, chickweed, henbit, purslane, Carolina geranium, stinging nettle, horseweed or marestail, oxalis, spurge, lambsquarters and more.